Yordano Ventura beans Manny Machado. 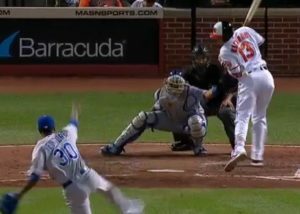 Kansas City Royals pitcher Yordano Ventura got nine games for zipping a fastball into the backside of Baltimore third baseman Manny Machado, who was slapped with a four-game suspension after their brawl earlier this week. Major League Baseball also fined each player an undisclosed amount. Ventura is a appealing his suspension, but MLB always go light on the pitcher. The Orioles, who in my opinion were the innocent victim in this, get the harsher penalty. You may ask how is four worse than nine? Baltimore loses their starting shortstop for four games. That’s an entire series they are without one of their better players who did nothing more than stand up for himself after it was clear Ventura was throwing at him. The Royals will miss Ventura for…one start. With a five-man rotation, the Royals could pitch Ventura on his next scheduled turn, have him start his suspension and he’d miss game. If they suspended him ten games, he would miss two turns in the rotation. I’m not saying Machado doesn’t deserve four, but Ventura should miss more than one game.